In the furious battle to provide the “complete” project experience, many outlets and home centers are putting packages together to help you get home projects and honey-do’s done. 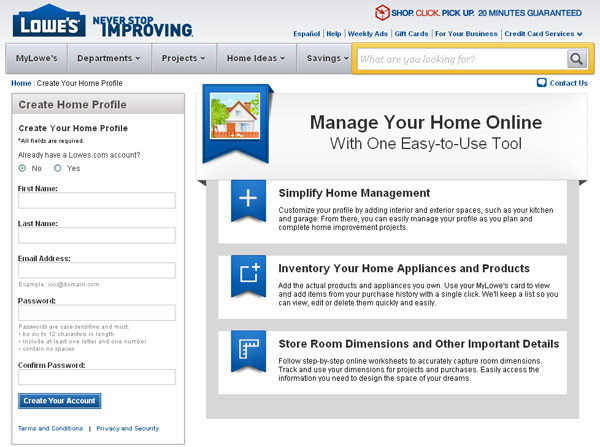 If you stop by the Lowe’s site, the front page has a link to the Home Profile Creation page. I have mixed feelings about this. On one hand, it’s pretty cool to be able to plan projects and have list items, pricing, and the total material sums for the the project, as well as pictures of how it might look when completed. On the other hand, my projects never seem to wind up going exactly to plan anyway. And a certain amount of (ok, to be fair, almost all) home projects I’ve undertaken require tweaking followed by some fairly serious swearing. Add to that I’m not crazy about my house plans, future projects, and buying history being stored and collated on the Lowe’s cloud, and I’m hesitant to run out and inventory my appliances on an online database — it’s like begging for targeted email campaigns. While I’m not quite ready to be fitted for a shiny pyramid hat just yet, I am a little gun-shy about giving a retailer that much access to my abode and project planning. It may be a great service — I’m guessing for folks overhauling their place or doing major work, it would be a godsend. For me, though, a shop pencil, scratch pad, and a lot of arm waving will do nicely. Then again, that may be why my projects grow legs on me too. “Manage My Home” is an online database/helpline/link library started by Sears a few years ago, and this sounds like a copycat service. One good aspect of the Sears site was the ability to look up any manual for almost any product that was ever manufactured. That may be a slight exaggeration, but it was a pretty robust database. They signed me on as one of their “experts” for the Q&A section, but after the published a few of my answers and failed to pay for them as agreed, I blew them off. Typical SHC behavior. So does this blog just do advertisements for companies now? What happened to the old toolmonger? Did you read the post? Not exactly a glowing testimonial. Add me to that list, and it’s not a tin-foil hat thing. I have worked for organizations that store info and I can attest first hand when they know where to find what they want they *will* find and use it. If the information is in *your* favor, it disappears. Whenever you leave an information trail you are leaving yourself open to those with agendas. It’s a sad reality, but even pulling a building permit (and submitting reno plans) can come back to bite, while a person who renos illegally can’t be proven at fault. HD used to have a very handy CD for “pros” that would assist in creating a list of all supplies for your project. However, you had to have some knowledge of the project before this would be helpful. I liked that it listed all the costs, materials and often cut lists. It sure made my bidding process easier. Maybe I’ll just fake an ID and sign on to Lowes to see how well it really works. Don’t forget “GuerrillaMail” for those one time emails. One of the great things about the Lowes site is it keeps a record of the materials you used such as paint colors and types of fixtures. This can also be done using an Excel spreadsheet. The one step they are missing though is having folks in their stores who know about building projects. If they had that they would be doing a great service to the DIY’ers and contractors working on new types of projects. As for past purchases, if the sale is written up at one of the department sales areas, that creates a record that can be looked back up by one of their associates. Most times though they don’t want to take the time. I started keeping a list of all my paint codes and where they are used a while ago. Usually i just snap a picture of the splotch they put on the code tag on the can. Then stuff that in a “house” folder i keep on DropBox, all done from the phone in a few seconds. And if Lowes has some way to prevent the “two trip minimum” for any project i think they have figured out how to see the future and should be using this technology for other things.